This is my 200th blog post! OK, that includes quite a few reblogs, but most of the previous 199 have ostensibly been mine, even if I quote extensively from the ephemera of art. So how should I celebrate my 200th blog? Perhaps by reviewing, in the words of Wallace and Grommit, a Grand Day Out in New Mills. This weekend has been Derbyshire Open Arts 2013. 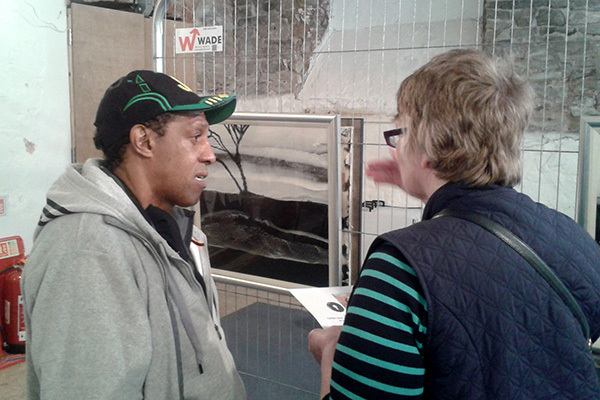 This event gave the public the opportunity to visit artists and craftspeople at venues across the county of Derbyshire. We only managed to visit New Mills, and even then only four venues. If it lasted three months rather than three days we might have been able to see everything! 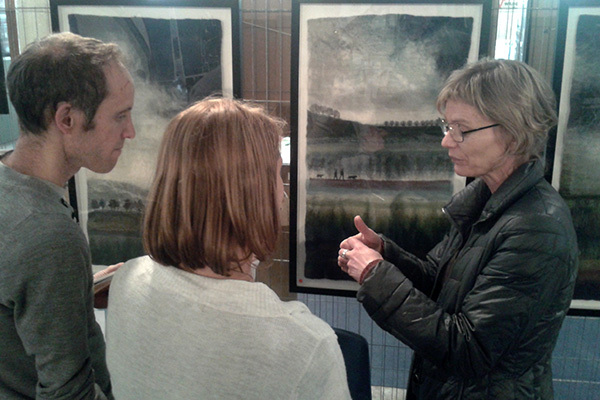 First off, we went to Torr Vale Mill where New Mills Arts had twenty artists on show. The Management went up one row and I went up another. When we met up she told me about a wonderful printer she had discovered. It turned out to be Colette Payne whose linocuts I have loved for years. We treated ourselves to one of her prints (but I’ve promised myself more in the future). The paintings Lloyd was showing were a result of these ‘experiments and accidents’. He uses gloss paint then, while it is still wet, he uses emulsion paint and ink which do not mix with the gloss. The texture and effects produced were excellent. Two other artists I liked were Valerie Wartelle and Val Hudson. Valerie is a fibre artist producing felted landscapes. She explained how she uses loose fibres and threads like a painter uses paints, spreading them where she wants them to go and building them up by wet felting them into the piece before finishing with embroidered detail. Now I have to admit I’m not the greatest fan of contemporary abstract painting. 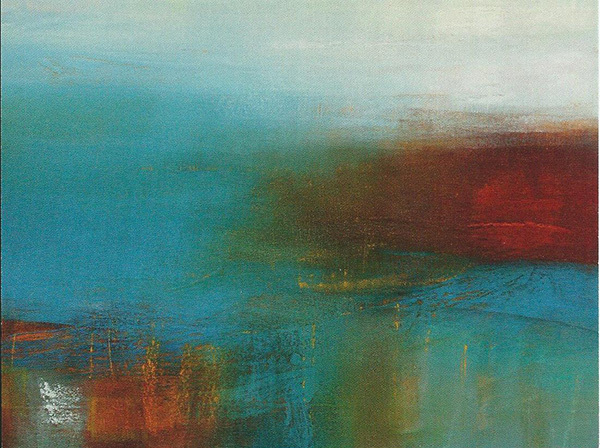 However I fell in love with the paintings of Val Hudson. Sadly, her four-figure prices were well out of my reach. Her statement explained how she “works on canvas using oil and wax which is layered and then, in part, scraped back in order to reveal what lies beneath.” This simultaneously produces a smooth yet textured surface to the work (if that makes sense). The Management and I then left Torr Vale Mill to seek out other artists, but I’ll leave that for another day. 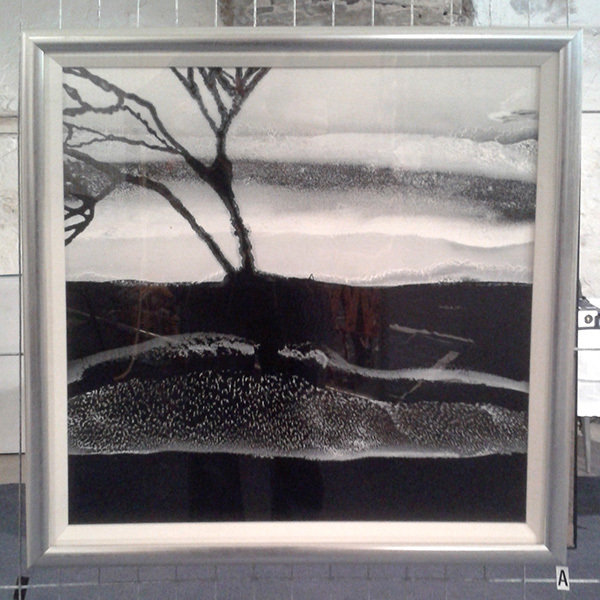 This entry was posted in Art, Art Gallery, Artists, exhibition, Landscapes, linocut, Painting, textiles and tagged art, artists, colette payne, derbyshire open arts, lloyd stephenson, new mills, new mills arts, torr vale mill, val hudson, valerie wartelle. Bookmark the permalink.